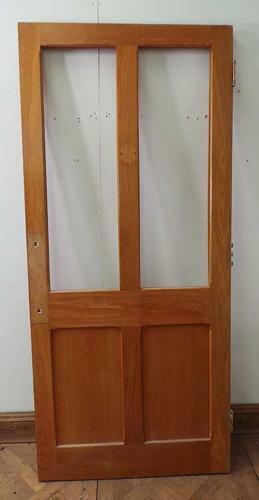 This lovely late Victorian/Edwardian solid oak door has an Arts & Crafts feel to it and is fully morticed and tenoned. The door has two long panels for glazing, over 2 shorter, solid panels, with a decorative Gothic chamfer detail to both faces. The door is in excellent condition. The door ise not currently glazed and will need to comply with current safety regulations. We are happy to quote for this, so please contact us with your requirements.